Addicting fried oyster mushrooms! Seasoned crispy outer crust with a tender meaty texture inside. Serve as an appetizer at your party or game day event; or even as part of a main course as it makes a great meat substitute for fried chicken! This post contains affiliate links which means if you purchase something from any of the links, Vegan With Curves will receive a small commission. All opinions are 100% my own. Please read my full affiliate disclaimer HERE. If you never had fried oyster mushrooms, once you do you will be hooked! I cooked these for my dad while watching the game and my dad ate the entire bowl only leaving me with 3 pieces (hey I still love the guy!) Yes they are that good! Oyster Mushrooms: As mentioned above oyster mushroom texture is what makes this fried mushroom recipe delicious. Sure you can use any mushroom for frying but then you won’t get that same satisfying texture as you would with these mushrooms. Oyster mushrooms are readily available and easily found at your local Asian market. Oyster mushrooms also contain good levels of zinc, folic acid, and niacin. Spelt Flour: Spelt flour works really well with this recipe. 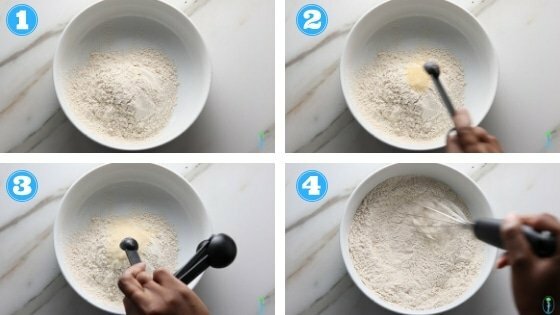 This works with chickpea flour too but with chickpea flour you get a more crisper thicker coating when fried and a lighter color (think of Popyees chicken texture). With Spelt flour you get a crispy but thinner coating when fried an a rich dark brown color (think of my former favorite KFC). Spelt is not a gluten free flour so it is not recommended if you have Celiac Disease. (Use chickpea flour instead). Multiple Uses! Craving a Po boy sandwich? Use these Fried Oyster Mushrooms. Miss fried chicken? Use these Fried Oyster Mushrooms. What a meatless finger food to go with your French fries? 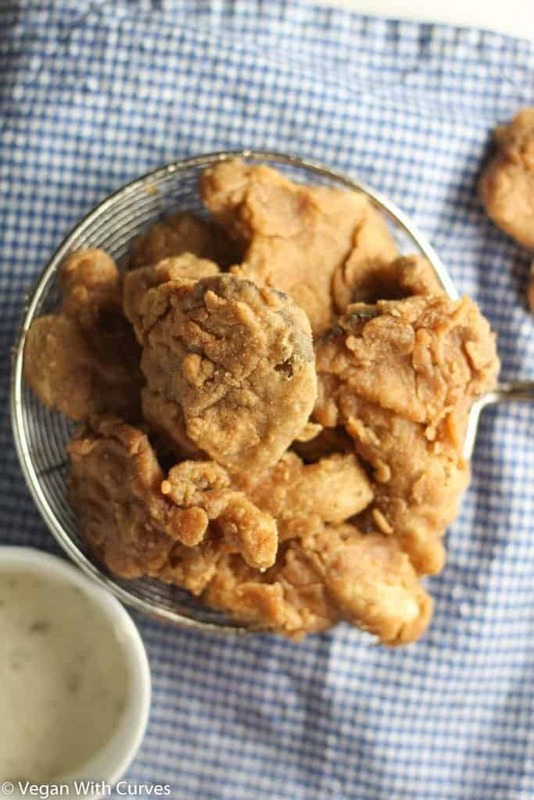 Use these Fried Oyster Mushrooms! You get the drift! The key to frying these mushrooms is having both a wet and dry batter. My dad tried to do it on his own with just the dry batter and it didn’t turn out to good (poor guy he didn’t know lol). First you make your wet batter by adding your flour, seasonings and water to a bowl and mix well until completely combined. 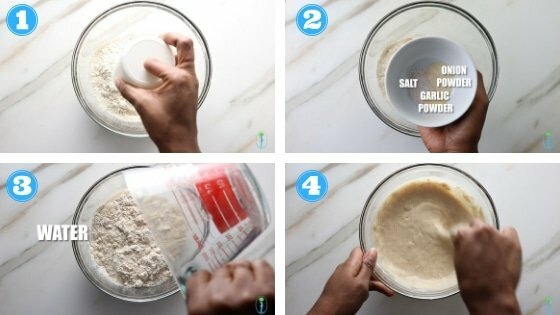 Next in a separate bowl make your dry batter by adding more flour and seasonings to a bowl and mix well until seasonings are fully incorporated into the flour. The you dip your mushrooms in your wet flour batter FIRST ONLY ONCE and then you coat them in your dry batter SECOND ONLY ONCE. Immediately add them to a hot oiled pan or deep fryer making sure not to over crowd them. Because this is not animal flesh, there will be no need to fry for more than 3 minutes until golden brown. Spelt in general is often something highly used in the alkaline vegan community. One cup of spelt flour has 11 grams of protein! Read Spelt Flour Builds Strong Bones & Aids Circulation for full knowledge of the benefits of spelt flour. How to make this Waste/Weight Release (Weight Loss) Friendly? Well to fried food isn’t something you think of when trying to release weight. However there is a way to occasionally enjoy these without completely going off you your goals. Don’t fry them! These mushrooms are great in stir fries simply sauté’ as you would regular mushrooms! Curve builders, even though this recipe is high in calories, fried food is nothing something that is healthy that should be eaten daily. But it’s nice to have as treat every blue moon. Enjoy! DID YOU MAKE THIS RECIPE? Tell me how it turned out for you! Was it a hit or miss? Tell me about it. Leave a comment below, rate it, and PIN IT! Also tag a photo @_VeganWithCurves and hashtag #VeganWithCurves on Instagram so I can see it! 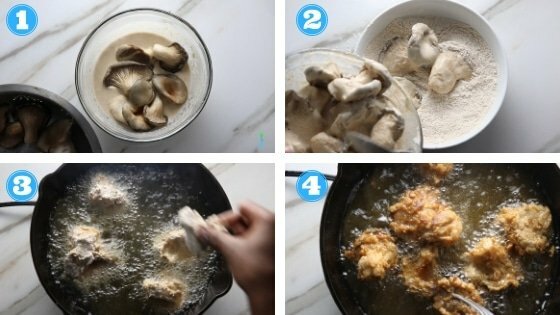 Addicting fried oyster mushrooms! Seasoned crispy outer crust with a tender meaty texture inside. Serve at as an appetizer at your party or game day event; or even as part of a main course! Take your oyster mushrooms out the package and place in a colander. Pull apart to desired size and rinse well. Start making your wet batter. Place 1 cup of spelt flour in a large mixing bowl along with garlic powder, onion powder, and sea salt. Add in water and mixed. 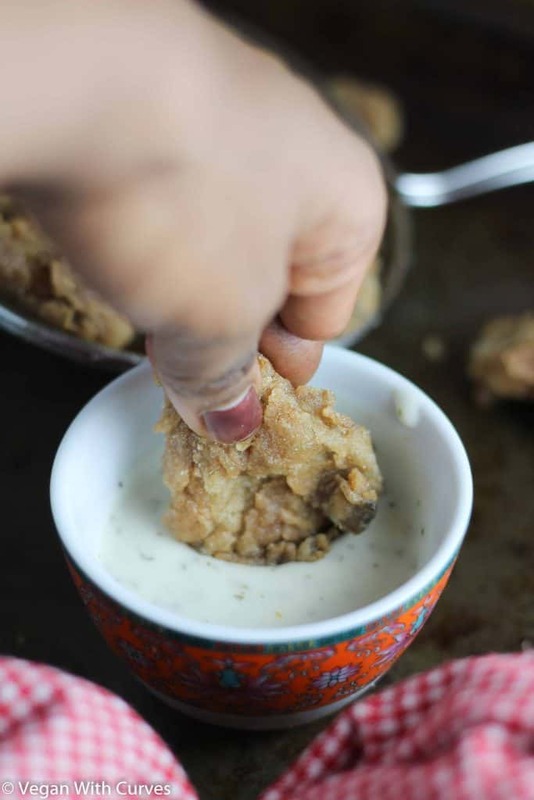 Batter should be the right consistency to coat mushrooms; not to thick and not to runny. Set aside. Grab a bowl 1 cup of spelt flour, garlic powder, and onion powder and mix until fully combined. Set aside. NOTE: You could use a large Ziploc bag for this to easily add your mushrooms and shake to get an even coat of the dry batter on the mushrooms. Next coat each oyster mushroom in the wet batter ONCE and place it in the the bowl and evenly coat with the dry batter ONCE. Do that for all pieces. NOTE: Using a Ziploc bag simply close the bag and shake vigorous until all mushroom are fully coated in dry batter. DO NOT GO BACK IN FORTH BETWEEN THE WET AND DRY BATTER TO PREVENT OVER BREADING IT WILL NOT TASTE WELL! Plug up your Fry Daddy Electric Deep Fryer and allow oil to get hot. (Or if using a cast iron heat oil in your iron until hot). Carefully place mushrooms in oil allowing mushrooms to fry for about 2 to 3 minutes until evenly browned. With your fry basket remove done mushrooms from oil and place on plate cover with a paper towel. Sprinkle with additional sea salt and dried parsley (opt) NOTE: Make sure your oil is hot and DO NOT overcrowd your mushrooms in the deep fryer or cast iron. If you need, divide mushrooms in half to cook a handful at a time. Serve with your favorite dipping sauces, on top of a salad, or along with your favorite sides for dinner! Feel free to use any flour of choice. I have tested this with only Spelt Flour an Chickpea Flour (a gluten free option) and the both work excellent for this recipe! I have never tried this in an Air Fryer (I currently do not own one) but it could work. Try it and let me know! You can try this with other mushrooms although I URGE you to use oyster. The texture of these mushrooms are unlike any other. You will not be disappointed! DO NOT OVER BATTER!! Dip once in the wet batter and once in the dry batter and immediately fry. I can't stress this enough. If you keep going back and forth between wet and dry batter multiple times you will end up with a overly breaded mushroom that will NOT be good at all. As an Amazon Associate I earn from qualifying purchases. Please read my full affiliate disclaimer HERE. You can try it that way I have never done it that way before. It probably won’t be as crispy. Thanks for sharing! I tried your recipe for oyster mushrooms tonight and they were amazing. My daughters do not like mushrooms but my youngest decided to give it a try. She really enjoyed them. Thanks again!! Girl !!!!!!!!!! Omg !!!!!! This recipe is so good. From my husband down to my 19 month old, it was a hit! Thank you for sharing !!!!! Satisfied! I cooked oyster mushrooms for the first time yesterday and they were absolutely delicious. I used your recipe it was “perfecto!” Lol. I must say I will be cooking them more often. Thanks for sharing your recipe. PEACE! Glad you enjoyed them! One of my FAVORITE recipes to make! Thank you for your comment! I made these today and omg they were bomb!! 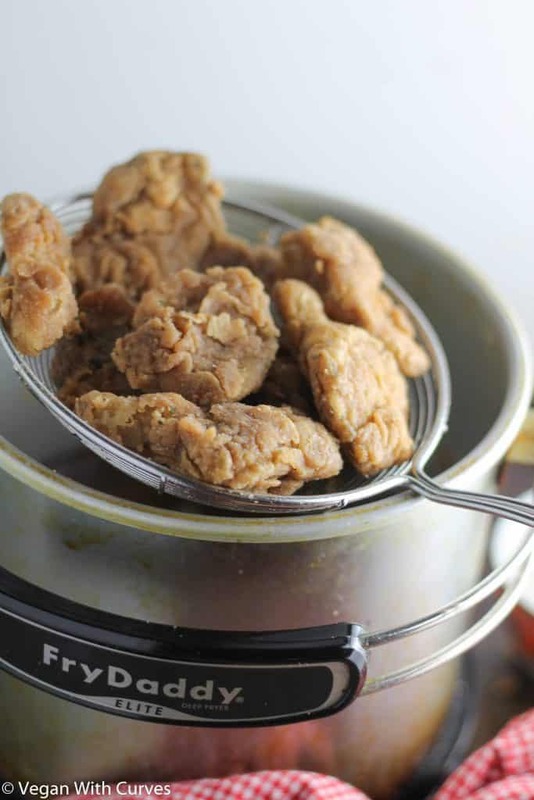 can you use this recipe in an air fryer? I have personally never tried it in an air fryer (I don’t own one) but a reader in the comment section mentioned they used an air fryer and it worked out fine. I used pre-packaged sliced portobello mushrooms and sliced onion rings with chickpea batter. I used your measurements lol. Came out perfectly in a black cast iron skillet, fried. Thank you! AWESOME! Thank you for the feed back so glad you like them! These mushrooms are delicious!!! Thank you so much!! I followed the recipe except I substituted safflower oil for the vegetable oil. I will definitely be making these mushrooms again!! Yay!! So happy you enjoyed them!!! Thank you so much for this recipe. I’m a New Orleans girl to my heart and I have been looking for a fried seafood substitute since I went vegan and yours is the first I felt confident enough to try. Wow! My non-vegan husband and sons are now hooked. I added a little mustard to the batter for a tang similar to oysters and now oyster mushroom poboys are the preferred option for everyone in my house. Thank you again! That is wonderful!! I am so happy you and your family enjoyed it! This warms my heart thank you so much for the feed back! 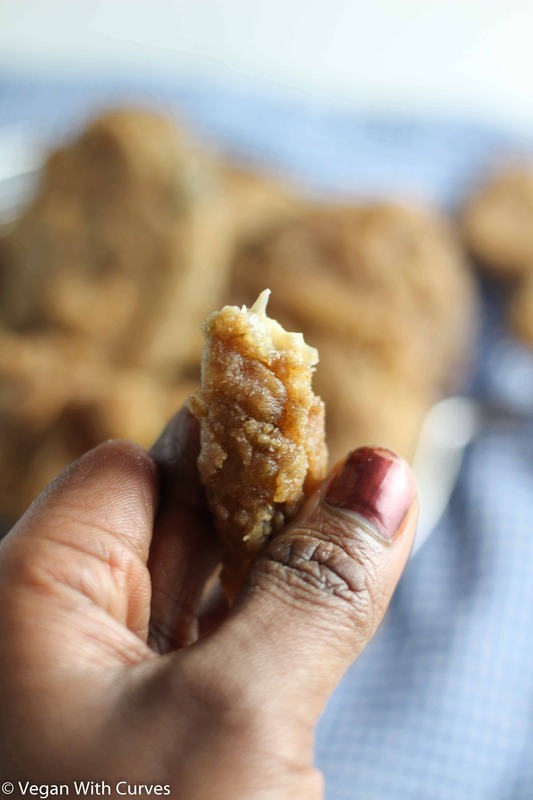 I used the airfryer with this recipe and it was so amazing. It was brown and crispy – I even double battered it! Yum yum yum, thank you for sharing this recipe! I am so happy it’s gluten-free as well!! You are so welcome!!! And thank you for the review!!! Hi! I was about to ask if this recipe was compatible with an air fryer but then saw your comment. Did you alter the recipe besides double coating them? Did you spray a little bit of oil on them before putting them in the air fryer? Thanks in advance!